what is the difference between a woofer with a hard suspension against a soft suspension? For example a klipsch kpt 8001 with hard suspension on the woofer vs a klipsch rb 81 lo a soft suspension. Grettings. what is the difference between a woofer with a hard suspension against a soft suspension? 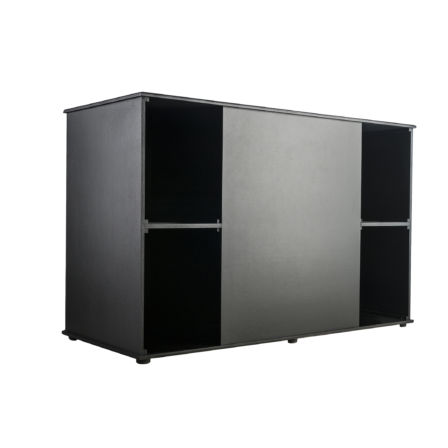 For example a klipsch kpt 8001﻿ with hard suspension on the woofer vs a klipsch rb 81﻿﻿ lo a soft suspension. Grettings. I would think it depends on the magnitude of the cone excursion that the speaker is required to perform. What you are calling hard suspension is meant for moderate excursion (KPT 8001), and the low modulation distortion (Doppler distortion) that comes with that. Soft suspension (RB 81) has deeper excursion, and may have more modulation distortion. The KPT 8001 is a profssional, THX approved cinema surround speaker, but it doesn't need to reach deep into the bass -- that would be taken care of by a massive, probably Klipsch, possibly horn-loaded, non-directional subwoofer behind the screen, such as the Klipsch 8002 which also has relatively shallow excursion. Therefore, the KPT 8001 doesn't need wide excursion. Other speakers that have low excursion are horn-loaded ones like the Klipschorn, the Jubilee, the La Scala, La Scala II, and the Belle Klipsch. These have a deeper bass reach than the KPT 8001 due to their size and design (horn loading), but still have shallow excursion. Deeper excursion (RB 81) is meant to create deeper bass reach in a small (bookshelf) enclosure, at the cost of higher modulation distortion, but not as much as some other manufacturer's designs. The RB 81 does have a bass reflex port, which also increases the bass. For a while, some people, including those with an axe to grind, denied that modulation distortion was very objectionable. Now, in some quarters, people are coming around. See the last three paragraphs of the following Stereophile article for the results of listening tests. Spider and surround will greatly affect keeping the cone aligned, particularly when having large excursions. They can also affect the excursion, FS, overall compliance, ability to return to resting position, and VAS among others. The overall parameters are based on the combination of magnet strength, voice coil, cone weight/size, and suspension parts. https://www.eminence.com/support/understanding-loudspeaker-data/ might be helpful reading.